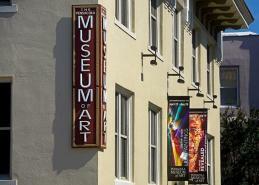 The Pensacola Museum of Art was founded in 1954 by a group of forward-thinking women artists who transformed the former city jail into a dynamic art and community center. The group, the local chapter of the American Association of University Women, set out to create a space that promoted art through exhibitions and education. The Pensacola Art Association, as it was named, balanced national exhibitions with opportunities for local artists. 65 years later, we endeavor to continue this legacy. Now, as a University of West Florida museum, we actively cultivate spaces for artistic growth and exploration through our education programs and exhibitions. We are proud to continue the tradition of the annual members exhibition and showcase the rich talent of Pensacola's creative community. Richard McCabe is a curator, photographer and writer based in New Orleans. He was born in England and grew up in the American South. In 1998, he received an MFA in Studio Art from Florida State University. Since 2010, he has been the Curator of Photography at the Ogden Museum of Southern Art. He has organized and curated over thirty exhibitions including: Seeing Beyond the Ordinary, The Mythology of Florida, The Rising, Eudora Welty: Photographs from the 1930s - 40s, The Colourful South, Self-Processing: Instant Photography and New Southern Photography. Richard McCabe’s photographs have been included in gallery and museum exhibitions throughout the United States including: Size Matters, Mobile Museum of Art, Mobile, Alabama, Instant Joy, AM Richard Fine Art Gallery, Brooklyn, New York, and Once Around The Sun, Boyd/Satellite Gallery, New Orleans, Louisiana.